Under the Making All Things New program of the Archdiocese of New York, many parishes were merged. Among those selected for merger were Annunciation Parish, located in the Crestwood section of Yonkers, and Our Lady of Fatima Parish, located in the Strathmore section of Yonkers. As of November 2014, the two parishes of Annunciation and Our Lady of Fatima were canonically merged into one parish. A merger committee, consisting of members of both parishes, was organized to help ease the merger transition. Under the leadership of Rev. Robert F. Grippo, the merger was completed on August 31, 2016, when the two parishes were merged civilly. Now known officially as Annunciation-Our Lady of Fatima parish, we operate a one family, with two churches, one school, one convent and one rectory. The former Our Lady of Fatima School (closed in 2013) continues its former purpose having been rented to an educational organization. The former Our Lady of Fatima Rectory has been repurposed as a location for our special needs Religious Education program, our alumni program and as a facility where a local special education program can teach life skills to its students. Both parishes had strong ministry programs that complemented each other, and the combination of all of that activity has resulted in a stronger parish – spiritually and as a social and community resource. We invite you to help us create our new history as we continue to grow our faith community in love, respect and service. Fr. 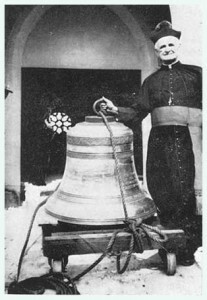 Timothy Dugan and the bell donated by the Feriola family. The history of Annunciation Parish is a rich story of community, dedication, and commitment. Like all stories of great communities, it is shaped and inspired by the people who made it part of their lives. Annunciation began as a mission of Immaculate Conception Church in Tuckahoe — a rather inauspicious beginning in a prefabricated building from Sears Roebuck. Through the dedication and hard work of our early parishioners, the original vision of its first Pastor Father Timothy J. Dugan, and the enthusiastic commitment of all who followed them, the dream of a Church in Crestwood took shape. Over the course of the first 25 years, the founders’ vision became the reality enjoyed today — Annunciation’s four corners at Westchester Avenue and St. Eleanora’s Lane, comprised of our School, Convent, rectory, and Church, the last cathedral-style stone Church built in the Archdiocese of New York. Father Dugan, in many ways, was the driving force of the early history of Annunciation Parish. His indelible vision of Annunciation Church, which he unabashedly called “The Cathedral of Crestwood,” is our inheritance. With the building of the School in 1950, the completion of the upper Church in 1957 and the school’s major expansion in 1960, the Parish expanded dramatically as young, World War II veterans, mostly first-generation Americans, and their families, moved up from apartments primarily in the Bronx and Manhattan. Today many of their descendants belong to the Parish and attend the School. They remain committed to meeting the growing, and changing needs of our Parish family — and the larger concerns of discipleship and apostolic activities in our community and in our world. They form the strong foundation of a dynamic and replenishing group of people who continue to advance the reputation and life of this Parish. 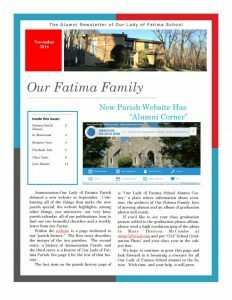 Amazingly the descendants of some of the Parish’s founding families remain active in today’s Parish life several generations later — their great-grandchildren attend the School that they helped build and nourish. We have the following Pastors to thank for their leadership of our Parish and their continued efforts to strengthen the fabric of our Parish through enhancements of, and additions to, our ministries and their care of our parish buildings. Christmas Day 1927 – Fr. Edward J. Beary, Pastor of Immaculate Conception Church in Tuckahoe, celebrated the first Mass in Crestwood at St. Patrick’s Chapel, a small, brown building ordered from Sears Roebuck, which was set up on the grounds of St. Eleanora’s Home (now St. Vladimir’s Seminary). May 10, 1931 – Msgr. Dugan, Joseph Hayes and Ralph Feriola meet with His Eminence Patrick Cardinal Hayes and His Excellency Bishop Dunn to incorporate the Church of the Annunciation. Mssrs. Hayes and Feriola are appointed lay trustees of the Parish. May 23, 1931 – First Communion is celebrated for nineteen children in the Chapel. The dream begins for a permanent Church building and a school in Crestwood. 1932 – Land is purchased for a Church on the northwest corner of Westchester Avenue and St. Eleanora’s Lane, using money raised by the Ladies’ Guild. November 17, 1934 – 50 children are confirmed at the first Confirmation ceremony in the Parish. May 10, 1936 – Ground is broken for the new Church. November 22, 1936 – The lower Church is dedicated by The Most Reverend Stephen J. Donahue, Auxiliary Bishop of New York. 1943 – The Crowley house, located on the southeast corner of Westchester and St. Eleanora’s, is purchased to be used as a school and convent. 1944 – The house next door to the convent is purchased and converted into 4 classrooms. July 1950 – Ground is broken for the School on the southwest corner of Westchester and St. Eleanora’s. The school was dedicated on March 23, 1952 by His Eminence Francis Cardinal Spellman. October 31, 1957 – The first Mass is said in the new Upper Church. The Church is dedicated on May 11, 1958 by His Eminence Francis Cardinal Spellman. September 1960 – The school’s brand new addition is opened, doubling the square footage of the school. The “new” school was dedicated on June 10, 1961. On Wednesday, November 3, 1948, the Archbishop of New York, Francis Cardinal Spellman, issued the official decree of the “erection of a new parish in Scarsdale under the patronage of Our Lady of Fatima.” That same day, the headlines proclaimed that Harry Truman had won the presidential election, to the surprise of the nation. The decree said further that the pastors of the three neighboring parishes in Scarsdale, Hartsdale and Crestwood “whose territories had been divided to furnish the territory of the new parish have been consulted.” Reverend Leo W. Madden was officially named pastor. The name of the new parish – Our Lady of Fatima – most likely derived from Fr. Madden’s close friendship with a journalist, William Thomas Walsh, who with Cardinal Spellman’s help, had made a number of visits to the remote pasture near Fatima, Portugal where Our Lady had appeared in 1917 to three children watching over their family sheep. The Macmillan Company published Dr. Walsh’s book titled “Our Lady of Fatima” in 1947. A prominent businessman made the Scarsdale Theater, a local movie house on Garth Road, available to the new parish for Sunday morning Mass. The first Mass was celebrated on November 7, 1948 on a portable altar on the stage of the theater. The congregation numbered about 100. Fr. Madden was quickly attracted to 85,000 square feet of open land at the southeast end of Garth Road in the Town of Eastchester, just east of the Bronx River. He arranged for its purchase from the town for $48,000. A contemporary architect’s drawing of the site shows a plan for a cruciform flat-roofed church with a steeple, and a later two-story school connected to a separate convent by a covered walkway. Essex Place bisected the property, and there was ample space for a playground and parking. He also purchased a house on Beech Hill Road for $30,000 as an interim rectory and parish house. By mid-January, about 600 people were attending Sunday Mass in the theater, and the pastor had moved into the second floor of the Beech Hill residence, making space for a chapel and converting first floor space into three classrooms. By the end of 1949, the parish numbered almost 1,000. The location for the new church seemed perfect, but it wasn’t. For one thing it would place the heart of the new parish at its extreme southeast corner of its parish boundaries (taken very seriously at that time). Additionally, it was determined that there was significant ground water from an underground tributary to the Bronx River running underneath the property. In May 1949, Fr. Madden wrote the Vicar General of the Archdiocese explaining in detail why it would not be in the best interest of the parish to build on the Garth Road property. He had, however, found property more suitable on the west side of the Bronx River in the City of Yonkers, a triangular piece of about 71,000 square feet at Strathmore and Scarsdale Roads. It was for sale at a price of $12,500. In August, the Church of Our Lady of Fatima had acquired that property, and the Garth Road property was sold to the Town of Eastchester. The construction of the concrete block church was begun. The granite cornerstone of Our Lady of Fatima Church reads “1950 – For God and Country” and by the end of 1950, a church had been built. The front of the church is faced with red-brown granite; on either side of the front doors is a coat of arms. One is Cardinal Spellman’s and the other that of Pius XII, who was Pope at that time. Over the front doors, whose upper third is etched glass of the Four Evangelists, is a sculpture of Our Lady of Fatima with the children and the sheep they were tending when she first appeared to them on May 13, 1917. Extending above the flat roof, against the sky, is the Cross. On December 2, 1950, a Solemn Mass was celebrated by the proud pastor. By September 1952, there were four grades in the house on Beech Hill, and the school was outgrowing itself. Anticipating the need for more space, Father Madden, with approval of the Archdiocese, had purchased six steep-wooded lots on the west side of Scarsdale Road for $6,500. 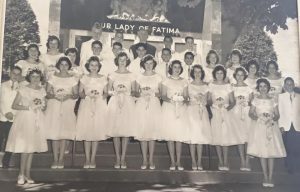 By October, he had been given permission to proceed with plans for the construction of an eight-classroom building with a convent on the top floor, and on September 14, 1953, Our Lady of Fatima School moved from the house on Beech Hill to the building on the hill across from the church. In 1978 and again in 1998, major restorations of the church have been undertaken. Though the architecture of the church is modern functional, (“less is more,” being the guiding principle) and the interior is eclectic, it is a tranquil blend of different centuries and traditions. More importantly, the strength of the faith of the parishioners is a testament to the strength of the priests who guided the parish. 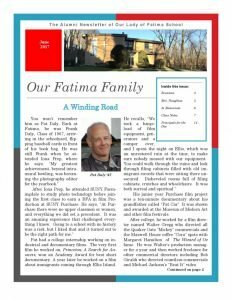 The stewardship of Our Lady of Fatima parish was shared by only 4 Pastors in its 67 year history – two spent over 20 years of their lives in the Our Lady of Fatima parish family. November 3, 1948 – A decree by Francis Cardinal Spellman creates the parish of Our Lady of Fatima out of territory previously covered by three other parishes located in Scarsdale, Hartsdale and Crestwood. November 7, 1948 – The first Mass of Our Lady of Fatima Parish is celebrated in the Scarsdale movie house on Garth Road. August 1949 – The parish purchases property at the corner of Scarsdale and Strathmore Road to construct its church. September 1950 – Classes for 36 pupils in grades K-2 commences in the Beech Hill house under the direction of Sister Mary Daniel Shannon and Sister Rose Anita, members of the Sisters of St. Dominic. December 2, 1950 – The first Mass is said in the new church building. Spring 1951 – 16 children make their first Holy Communion in the new church. October 1951 – 64 children receive the sacrament of Confirmation from Bishop Joseph F. Flannelly. January 19, 1953 – Ground is broken for a school building across Scarsdale Road from the church. 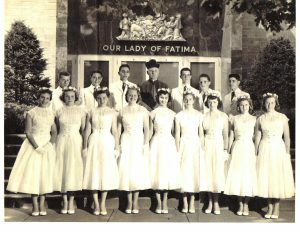 September 14, 1954 – The construction of Our Lady of Fatima School is completed at a cost of $35,000, and 160 students in grades K-5 occupy the school. The school was dedicated on November 15, 1953 by His Eminence James Cardinal McIntyre, Archbishop of Los Angeles. 1954 – The Rectory is constructed on the east side of the church. 1960 – The Shrine to Our Lady of Fatima is built into the hillside below the school. June 2013 – Our Lady of Fatima School graduates its final class and closes its doors. Though Our Lady of Fatima School closed in June 2013, our alumni live on, and the spirit of OLF School lives in them. 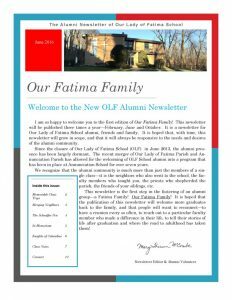 The merger of Our Lady of Fatima Parish with Annunciation Parish in September 2016 provided the opportunity to include OLF School graduates in the alumni program of the parish. This Alumni Corner is your resource for OLF School alumni news and reunions. A reunion is being planned for the classes ending in 1968, 1978, 1988, 1993, 1998 and 2008. The reunion will be held this spring. If you are a member of any of these classes, please let your friends know about the reunion, and ask them to contact Mary Theresa McCombe at marytmccombe@gmail.com for more information. The majority of the communication will be done by email, so we must have their email addresses in order to send them reunion information. 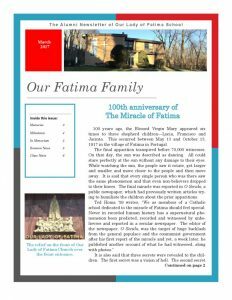 Our Fatima Family is published three times a year – March, June and November. The first issue was published in June 2016. 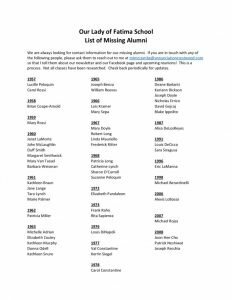 Please help us locate the following missing alumni. 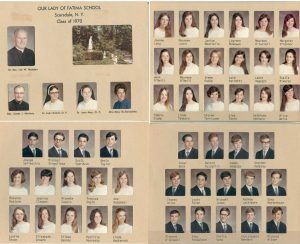 Stay in touch with OLF alumni on our Facebook page here. You may contact the alumni program coordinator, Mary Theresa McCombe, at marytmccombe@gmail.com.